With quite an impressive international resume to her credit already, Piret Raud is still a relative newcomer in the United States. Raud has illustrated dozens of books, written 16 books for children, and is an award-winning favorite in her corner of the world in Estonia. Why she is not a household name in the US is a mystery, but that is perhaps about to change with the publication of The Ear. A psychotherapist’s delight, The Ear capitalizes on the soft skills of listening, empathizing, and building relationships. In a playful manner of self-discovery, the ear slowly realizes what her gifts are and how she can apply them in her world. Finding herself cut off from the head on which she had lived, the ear is feeling lost, untethered, without direction or purpose. Depressed and woeful, the ear wanders around swimming like a fish, riding on the back of a snail, becoming one wing of a butterfly, until she hears the forlorn croaking of a heavy-hearted frog who has no one to sing for. The ear stops for a while to listen. Lo and behold both frog and the ear begin to feel better. Word spreads that the ear is a good listener, and now the elephant seeks out the ear to unload the story behind his aching homesickness. In due course “creatures came from far and wide” for a chance to sit with the ear who was astonished to be able to help just by listening and understanding. The pitfalls of this kind of intimate interaction lurk nearby and spider enters the scene with her toxic negativity, gossip and “poisonous words.” Spider entangles the ear in her web, trapping her. 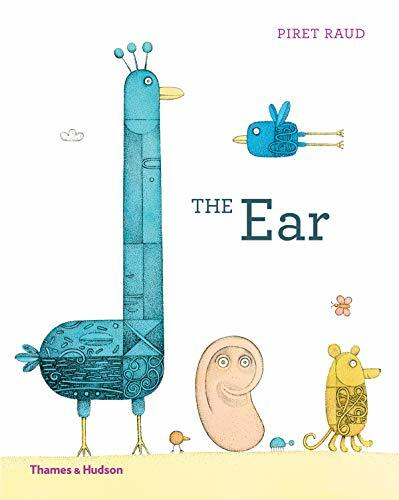 Frog, Elephant, and the other critters come to the ear’s rescue, reciprocating the kindness the ear had previously shown to them. Evil intentions are no match for the bond created through sympathy. Both children and adults will appreciate the bold artwork. Each animal is a patchwork of lines and swirls at once a recognizable creature as well as an altogether unique image. Entire stories and moods are drawn into the animals so that they embody their role in the ear’s self-discovery. Hare’s character is particularly clever as he carries the weight of a snowman on his belly, full of guilt for having devoured the carrot that was once the snowman’s nose. Tasteful page spreads are fresh and imaginative with plenty of breathing space, effectively defending Raul’s award-winning approach to design. On the flip side is the nagging promotional declaration that is a loose association at best. Being billed as the ear that Vincent van Gogh cut off from his head in a fit of temperament is not relevant or necessary to the plot and ceases to be integrated into the book further than the advertising blurb. Bordering dangerously close to false advertising, this incongruous connection was probably not the best choice as it only serves to grab the attention of the adults who are making the initial reading selection decisions. The target audience of preschoolers is not going to relate to this premise and will instead find appeal in the artwork and the ear’s plight to find purpose. The advice is to ignore this claim because what matters most here is not whose ear it was, but that it was indeed an ear. In a clean, straightforward manner, Raud spins a darling story. The message is clear, but not preachy or imparted from a moral high ground. One can, as The Ear gently demonstrates, find great satisfaction in the occupation of listening. There is a huge need for developing and encouraging these skills which are systematically overlooked in our world of S.T.E.M. (Science. Technology. Engineering. Math.) The Ear is a good choice to help balance this out.